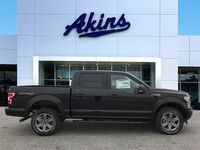 After a successful 2018 model year, Ford has brought its most luxurious pickup truck back for the 2019 model year in the form of the 2019 Ford F-150 Limited – which is available now at Akins Ford near Atlanta, GA. 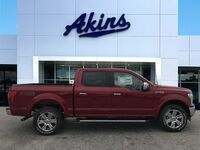 Perfectly combining upscale luxury features with the best-in-class power and capability Ford trucks are known for, the 2019 F-150 Limited is the perfect choice for anyone looking to work hard while also staying comfortable and connected. 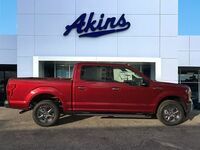 And when we say comfortable and connected, we mean it, as the 2019 Ford F-150 Limited features a luxurious new Camel Back dual-tone interior complete with a genuine ash swirl wood interior trim, aluminum-wrapped bezels, leather front seats complete with heating, ventilating and massaging settings, a standard SYNC 3 infotainment system, standard Apple CarPlay and Android Auto compatibility, a standard FordPass Connect 4G LTE modem capable of providing Wi-Fi to a total of 10 devices, and a standard HARMAN B&O PLAY premium audio system. Since we’ve already touched on many of the features that make the 2019 Ford F-150 Limited as luxurious as it is, let’s now check out some of the features that make it so very powerful, capable and safe. As we noted earlier, the 2019 Ford F-150 Limited features the best-in-class power and capability you’ve come to expect from a new Ford F-150. That’s because the 2019 F-150 Limited features an all-new high-output 3.5-liter EcoBoost V6 engine capable of pumping out 450 horsepower and 510 pound-feet of torque. But all the luxury, power and capability in the world means nothing if the new Ford F-150 Limited doesn’t also keep you safe while you’re hard at work. 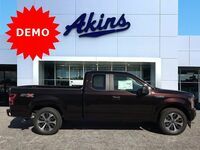 This isn’t something you have to worry about with a 2019 F-150 Limited, however, as its standard suite of safety and technology features includes an updated integrated trailer brake controller, optimized adaptive cruise control technology complete with stop-and-go capabilities, enhanced pre-collision assist technology complete with automatic emergency braking capabilities, next generation active park assist technology, next generation lane-keeping technology, and an all-new 360-degree camera that itself features split-view and dynamic hitch assist settings. Newly updated and segment-exclusive Pro Trailer Backup Assist technology is also available for the 2019 F-150 Limited. 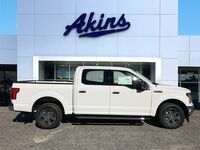 To learn more about the 2019 Ford F-150 Limited, please contact our Akins Ford staff near Atlanta, GA.